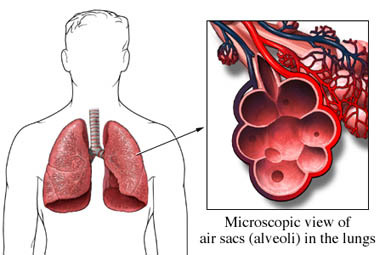 Pneumonia is a serious infection of the lungs that causes the air sacs in the lungs to fill with pus and other liquid. The infection may be caused by bacteria, viruses, fungi, and mycoplasma. In general, pneumonia is divided into 2 types: community-acquired, or hospital- or nursing home-acquired. You may get pneumonia through a simple encounter with an organism that you breathe into your lungs. Whether or not illness occurs depends several factors, including the contagiousness of the organism, the number of organisms that are inhaled, and the ability of the immune system to fight infections. In the US, pneumonia is a very common illness, especially among people who are elderly. What are the risk factors for pneumonia?What are the symptoms of pneumonia?How is pneumonia diagnosed?What are the treatments for pneumonia?Are there screening tests for pneumonia?How can I reduce my risk of pneumonia?What questions should I ask my doctor?Where can I get more information about pneumonia? Koulenti D, Rello J. Hospital-acquired pneumonia in the 21st century: a review of existing treatment options and their impact on patient care. Expert Opin Pharmacother. 2006;7(12):1555-1569. Learn about pneumonia. American Lung Association website. Available at: http://www.lung.org/lung-health-and-diseases/lung-disease-lookup/pneumonia/learn-about-pneumonia.html. Accessed November 10, 2016. Mandell LA, Wunderink RG, Anzueto A, et al. Infectious Diseases Society of America/American Thoracic Society consensus guidelines on the management of community-acquired pneumonia in adults. Clin Infect Dis. 2007;44 Suppl 2:S27-S72. Pneumonia. National Heart, Lung, and Blood Institute website. Available at: http://www.nhlbi.nih.gov/health/health-topics/topics/pnu. Updated September 26, 2016. Accessed November 10, 2016.